We all know we should be eating more fruit and vegetables and less processed foods like sugary drinks, white bread, ice cream and those mysterious deep fried chicken nuggets (do they actually contain chicken?). The media is saturated with the “eat more vegetables” message like so many beef patties in a McDonald’s fryer. It’s hard to avoid. A diet high in fruit and vegetables and other whole plant foods such as legumes, seeds and nuts is strongly recommended by all major medical authorities for the management of a range of health complaints including obesity, high blood pressure, type 2 diabetes, heart disease, hyperactivity, depression and even dementia. 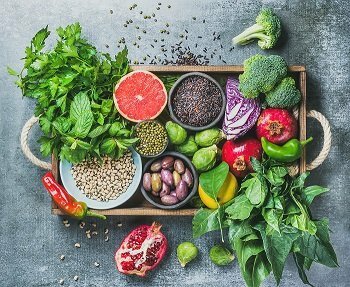 We know whole plant foods are beneficial to our health due to the diversity and concentration of vitamins and minerals they deliver to the body as well as their very high fibre content. Highly processed foods on the other hand have almost none of these qualities. However there is another reason why whole plant foods are so good for us and it’s to do with the way they alkalise in the body. What’s so good about alkalising foods? The main benefit of alkalising foods is that they reduce your body’s acidity levels. Why is this a problem? Most people’s pH urine levels are too acidic. There is some evidence that suggests people with highly acidic urine samples are at a greater risk of a range of health problems than those who’s urine samples are more alkaline. How can you tell if your diet is too acidic? A simple pH test will tell you immediately if your diet is too acidic by measuring acid levels in your urine. It’s important to note that a pH test does not measure your blood acid level. It only tests acid levels in your urine. Levels of acid in the blood remain consistently at a pH level of around 7.4. If this level changed greatly you would be looking at a life-threatening situation. Only acid levels in the urine fluctuate regularly, and these changes occur as a result of the body adjusting to the acidity level of the food you’re consuming. Your body is always working had to maintain that critical 7.4 mark, so if you eat a highly acid-promoting meal your body will expel the excess acid through your urine. What does an alkaline diet look like? On an alkaline diet your aim is to increase the amount of alkaline-promoting foods you consume and decrease the amount of acid-promoting ones. It’s no more complicated than that. However it’s important to be aware that some foods that we consider acidic, such as tomatoes and lemons, actually become alkalinising agents once they the enter the body’s digestive system. Almost all fruits (pineapple and raspberries are two exceptions). With our busy lifestyles it can be hard to know if we’re getting enough alkalinising vegetables, fruits, seeds and legumes in our diet – and this is where a quick and simple pH test can help. Used over a period of time, pH tests can monitor acid levels in your urine and paint a picture of what’s going on inside the rest of your body. Get in touch with National Custom Compounding to enquire about our very affordable pH tests, or you can also purchase a pH test online. *The Alkaline Diet: Is There Evidence That an Alkaline pH Diet Benefits Health?, Dr Gerry K. Schwalfenberg, Journal of Environmental and Public Health. Published online 2011 Oct 12.